Sainted Dimitrii, Metropolitan of Rostov (in the world Daniil Savvich Tuptalo), was born in December 1651 in the locale of Makarovo, not far from Kiev. He was born into a pious family a grew up a deeply believing Christian. In 1662, soon after his parents resettled to Kiev, Daniil was sent to the Kievo-Mogilyansk college, where the gifts and remarkable abilities of the youth were first discovered. He successfully learned the Greek and Latin languages and the whole series of classical sciences. On 9 July 1668 Daniil accepted monasticism with the name Dimitrii, in honour of the GreatMartyr Demetrios of Soluneia (Thessalonika). Prior to the Spring of 1675 he progressed through the monastic obediences at the Kiev Kirillov monastery, where he began his literary and preaching activity. 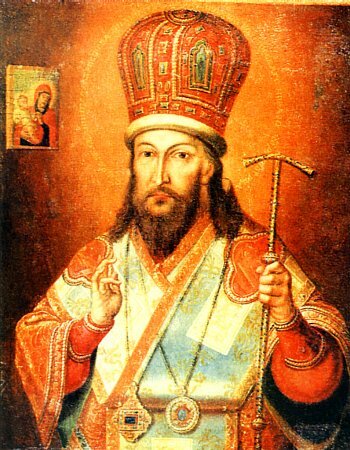 The Chernigov archbishop Lazar (Baranovich) ordained Dimitrii as priestmonk on 23 May 1675. Over the course of several years Priestmonk Dimitrii asceticised and preached the Word of God at various monasteries and churches in the Ukraine, Lithuania and Belorus. For a certain while he as hegumen of the Maksimovsk monastery,and later the Baturinsk Nikol'sk monastery, from where in 1684 he was summoned to the Kievo-Pechersk Lavra. The head of the Lavra, archimandrite Varlaam (Yasinsky), knowing the high spiritual disposition of his former student, his education, his proclivity for scientific work, and also his undoubted literary talent, – entrusted to the Priestmonk Dimitrii the organising of the Chetii Minei (Lives of the Saints, Meneion) for the whole year. From this time, all the further life of Saint Dimitrii was devoted to the fulfilling of this ascetic work, grandiose in its scope. The work demanded an enormous exertion of strength, since it necessitated the gathering and analysing of a multitude of various sources and to expound them in a fluent language, worthy of the lofty subject of exposition and at the same time accessible to all believers. Divine assist did not abandon the saint over the course of his twenty year labour. According to the testimony of Saint Dimitrii himself, his soul was filled with impressions of the saints, which strengthened him both in spirit and body, and they encouraged faith in the felicitous completion of his noble task. And at the same time as this, the Monk Dimitrii was head of several monasteries (in succession). The works of he ascetic brought him to the attention of Patriarch Adrian. In 1701, by ukaz-decree of tsar Peter I, Archimandrite Dimitrii was summoned to Moscow, where on 23 March at the Uspensky-Dormition cathedral of the Kremlin he was ordained Metropolitan to the Siberian cathedra-seat of the city of Tobol'sk. But after a certain while, because of the importance of his scientific work and the frailty of his health, the saint received a new appointment to Rostov-Yaroslavl', whither on 1 March 1702 he arrived in the capacity of Metropolitan of Rostov. Just as before, he continued to be concerned about the strengthening of the unity of the Russian Orthodox Church, weakened by the Old Ritualist schism. In his inspired works and preachings many a generation of Russian theologians drew spiritual strength for creativity and prayer. For all Orthodox Christians he remains an example of a saintly, ascetic, non-covetous life. At his death, 28 October 1709, they found with him but few possessions, except for books and manuscripts. The enumeration of Sainted Dimitrii, Metropolitan of Rostov, to the ranks of the Saints was made on 22 April 1757. Celebration to him is made likewise on 21 September, on the day of the uncovering of relics.